This is the second and last of my Papal visit to St. Patrick’s Cathedral ankle. 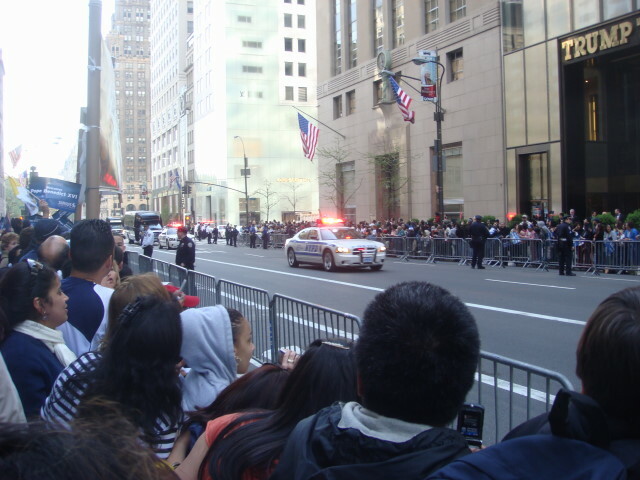 That is, this is the second post about me ankling to the Papal motorcade down Fifth Avenue. The Cathedral is very impressive, but it doesn’t have an ankle that I’m aware of. 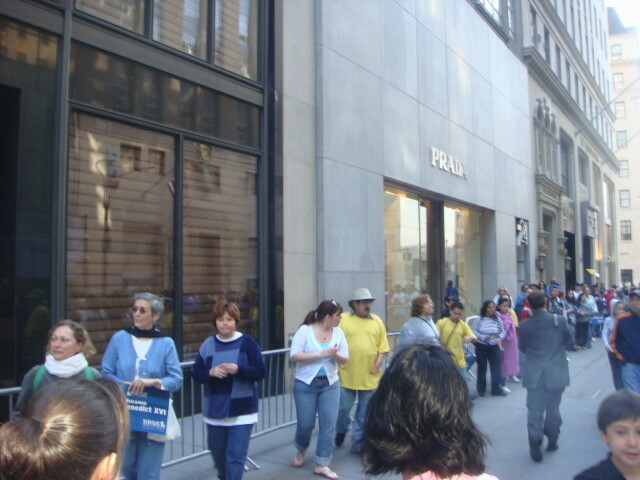 So, I got to Fifth Avenue and 56th Street and was standing amidst the crowd. The line to the barricade was two or three people deep and this crowd had made a lot of home-made signs. The picture below shows the big banner they had. It was supported by some sort of long cardboard tubes. 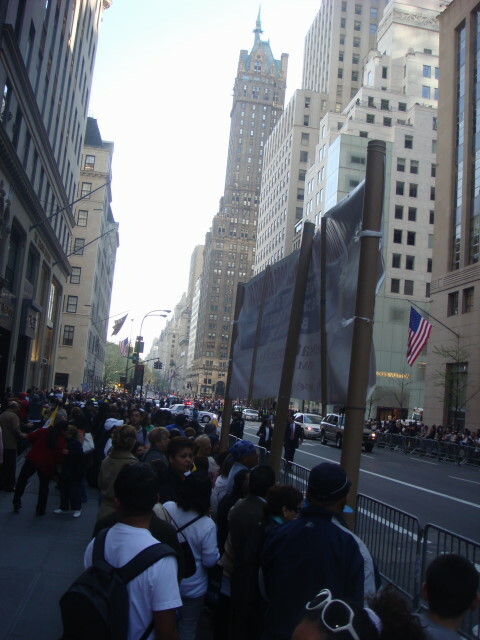 I feared for my chance to view Pope Benedict XVI once these people had all picked up their banners. But, he was supposed to come in the Popemobile and I figured I’d see at least a part of him. Over the few minutes that I had been there, the dancers had grown in number and were doing their song and dance in a long line. As I said before, the crowd would occasionally join in on the chorus. To call this pleasant is a huge understatement. It was, at least to a very small extent, sublime. 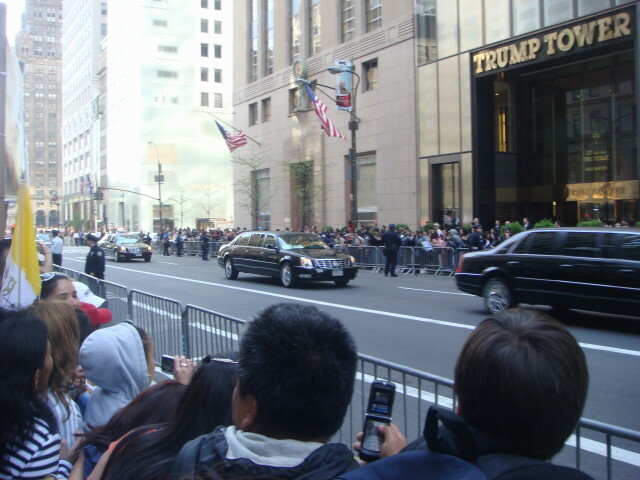 At about 8:50am, I noticed a Secret Service guy walking just inside the street, looking very carefully at the crowd. 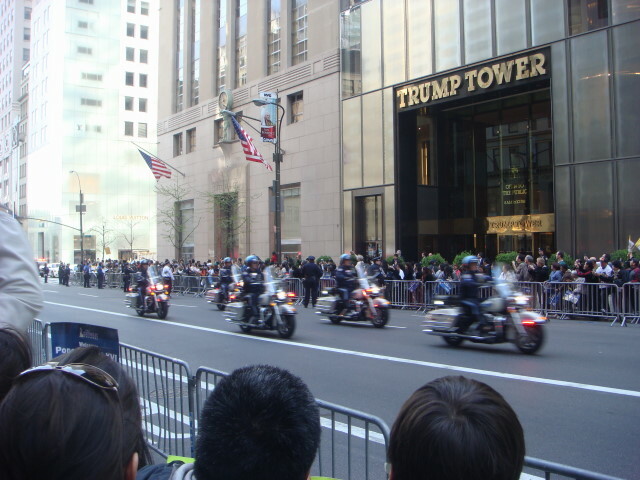 In the distance, the number of flashing lights grew in number and then the motorcycles came. This is only one of four pictures of the motorcycles that I got. And my camera has a long delay between pictures. There were perhaps 30 of them. Then the standard black SUV. I’ve no idea if it was staff or cops or both in it. Doesn’t matter. 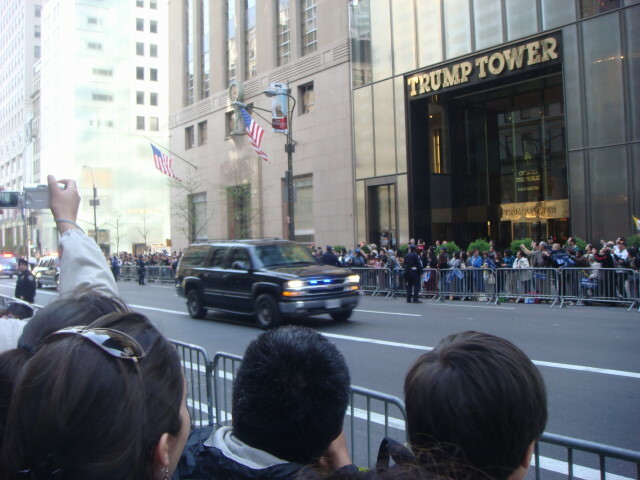 And another SUV followed by a limo. And another limo. Actually, three of them. Or was it a total of four limos after that second SUV? But I hadn’t seen the Popemobile. No bubble-top. No standing,sitting, or propped up figure in ancient garb. Just a bunch of limos with no sign as to who was in which. The limos were followed by this vehicle. Probably an emergency truck, maybe it was an ambulance. And it was followed by this cop car. 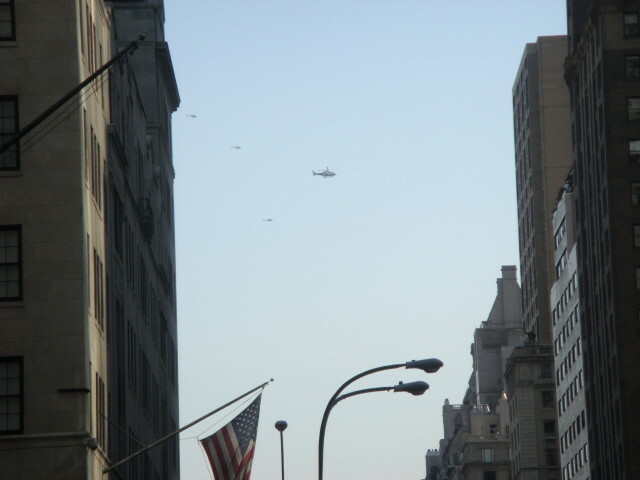 The helicopters had all of us wondering if the Pope was coming now. There was virtually no movement for a few minutes and then the cops started to let traffic start flowing east-west. 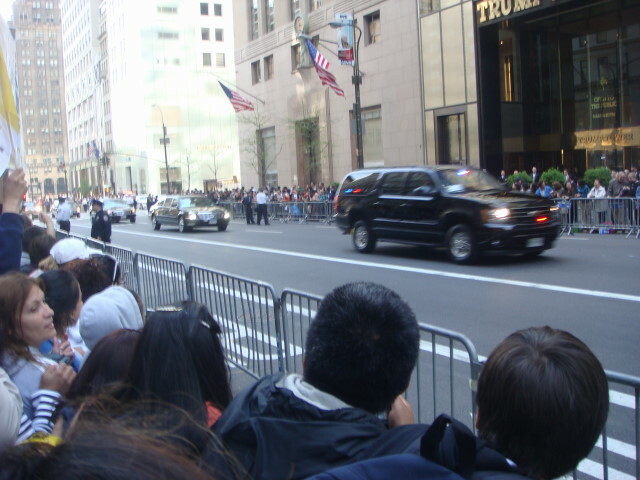 So, did I see the Pope? I’d have to say No. Did the Pope see me? I’d have to go with the woman and say, Yes. The Pope got the lesser of the deal. 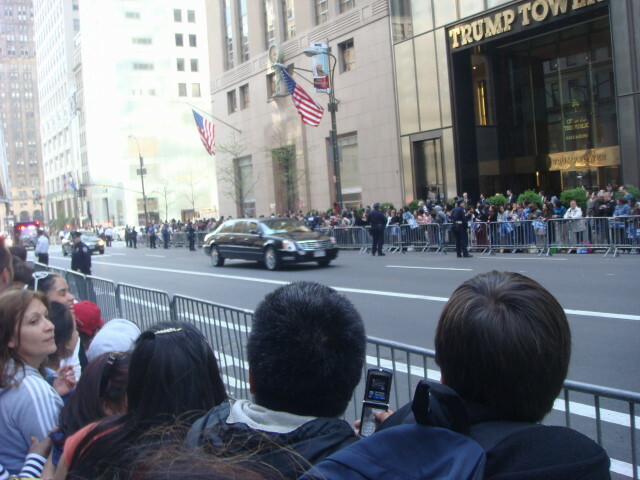 This entry was posted on April 21, 2008 at 5:20 pm and is filed under Celebrity Points, Events, Manhattan, Mid-town. You can subscribe via RSS 2.0 feed to this post's comments. You can comment below, or link to this permanent URL from your own site. Hi Famous! It’s Cuzzn Cathy’s friend again. I check your blog frequently, even though I don’t write very often. It’s great. Keep up the great reports. Reading them is the next best thing to being in NY. 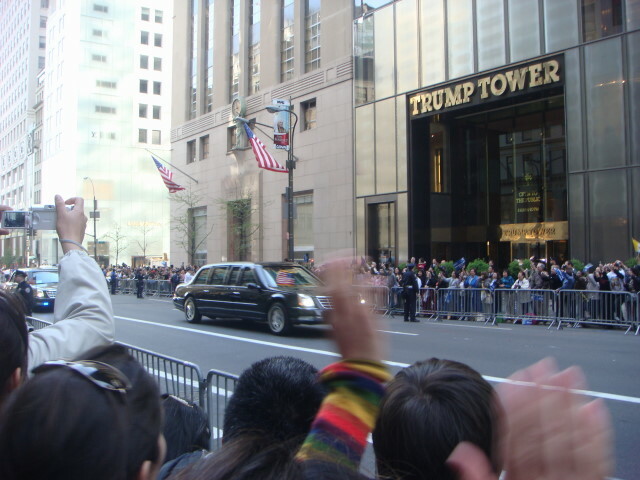 PS – While I was in NY, I saw a “Free Tibet” protest, and I thought of your blog. It’s good to hear from you again Lucy. You’re always welcome to comment or just poke around. 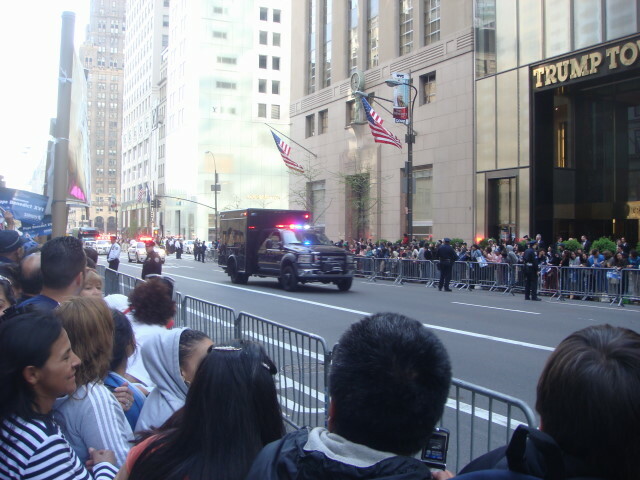 The Popemobile was in town, but the only time I heard of him using it was at Ground Zero where it was used to go up and down the long ramp.